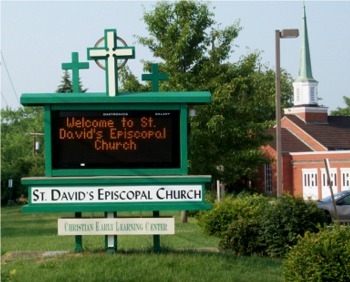 St. David’s sign. The old church can be seen at the right. 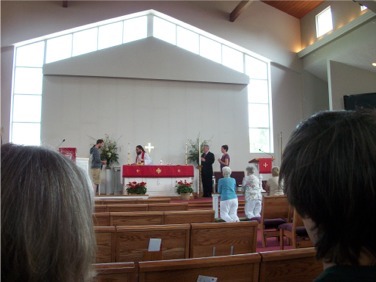 Episcopal Church services returned to St. David’s in Peters Township on this day of Pentecost. 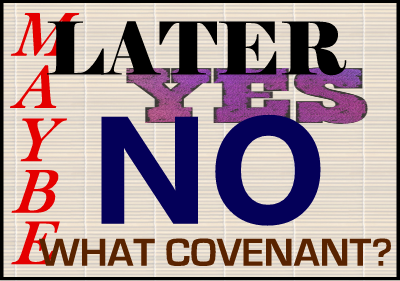 (See “Changes Coming to Pittsburgh Diocese.”) The Rev. Kris McInnes, associate rector of my own parish, St. Paul’s, Mt. Lebanon, conducted services at 8 o’clock and at 10:30. He also presided over an informational meeting between the services. When I arrived at the East McMurray Road property, I was delighted to find that the signage now declared the church an Episcopal, not an “Anglican,” facility. I was also happy to see that the electronic portion of the sign had been reprogrammed, not only welcoming worshipers to an Episcopal church but also giving the times of services and of the parish meeting. I had not visited St. David’s since the 2002 diocesan convention at which then Bishop Robert Duncan’s take-no-prisioners march to the right became painfully evident. I had forgotten what an impressive facility St. David’s is. The parking lot is enormous, there is a rectory on the property, and there is a good deal of undeveloped land behind the church. In 2001, the congregation built a completely new worship space that, unfortunately, never seems to have attracted sufficient worshipers either to fill it or pay for it. The new church is of a pleasing contemporary design and is well-equipped to support worship in a variety of styles. St. David’s. The new church is at the right. As I was taking pictures outdoors, Elaine Coleman drove up and said hello. She is a former St. David’s parishioner who has been worshiping at All Saints’, Bridgeville, and wanted to see what was happening at her former parish. She was one of a number of people who had once worshiped at the Peters Township church who showed up this morning, though most such people came only for the 10:30 service. When we entered the building, we were greeted with a table containing sign-up sheets—more on that later—and a table containing a variety of breakfast foods and a cake. Juice was plentiful, but coffee was in short supply. 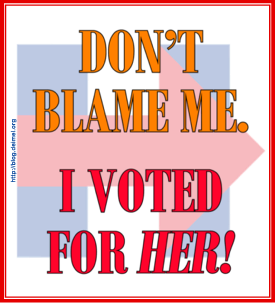 (This is a problem that needs to be fixed by next Sunday!) The people who had attended the early service were milling around and talking. I was able to have a brief conversation with Kris, who was making more coffee in a painfully small coffeemaker. He told me that there were 10 people at the early service. Kris grew up at St. David’s, and I asked him how it felt to be coming home. He indicated that it did not feel quite as strange as it might have. He had left for college before the new church was built, so, although he was, in a sense, returning to his roots, he would be leading services in a place where he personally had never worshiped regularly. Obviously, however, he knew most of the people who would attend St. David’s this morning, and his mother and sister were prominent among the St. David’s people returning to the Episcopal Church fold. Kris explained that services had been scheduled at 8 and 10:30 because those are the times at which services have been scheduled at the church, but he suggested that the two services might soon be consolidated into one. He asked if anyone would be upset if only a Rite II Holy Eucharist were offered on Sunday morning. No objections were registered. There is an urgent need, Kris said, for a treasurer. People from St. Paul’s are available to help a new treasurer get up to speed. (Only the ability to balance a checkbook is required, we were told.) Additionally, there will need to be volunteers to be on altar guild and vestry, and other volunteers to serve as ushers, chalice bearers, and the like. He invited people to put their names on the sign-up sheets I mentioned earlier to begin building a list of parishioners and possible volunteers. We want to be transparent, he said, and not cut corners. Some changes will need to be made to parish bylaws, allowing for a vestry smaller than the currently required 12, for example. Inevitably, I suppose, someone asked if the things that had been said about The Episcopal Church during St. David’s’ “Anglican” days were true. (The person who asked the question referred to a “packet of materials” that had been promoted at the church. I presume the “packet” was the scurrilous document from the American Anglican Council, “The Episcopal Church: Tearing the Fabric of the Communion to Shreds.”) Kris pointed out that only a few church leaders were quoted in the material in question and that the church’s theology is determined by its prayer book, not by its leaders. He suggested that bishop-elect Dorsey McConnell is quite orthodox in his beliefs and will work to bring us together. The focus at St. David’s will not be on church politics, he added, but on love, charity, and grace. I added that The Episcopal Church has both liberal and conservative bishops and that Anglicanism, historically, has been characterized by its theological diversity. By the time we were ready to begin the second service, there were roughly 40 people in the church, including a handful of children. I'm not sure how many were in what category, but the congregation included people who had remained at St. David’s after the 2008 schism, recent and not-so-recent former parishioners, and well-wishers. Kris begins distributing the elements of communion. Kris delivered a fine sermon based on the reading from John’s gospel. He emphasized that St. David’s will be a church of love, charity, and grace, a place where love and peace will be offered where there has so often been discord and hate. He pointed out that apostles Matthew, a tax collector for the Romans, and Simon the Zealot were poles apart yet were brought together by Jesus. If those two could get along, he said, we can all come together at the same table. At the announcements, Kris repeated some of what he had said at the earlier meeting, and again encouraged sign-ups and volunteers. He also read a letter from Bishop Price. The bishop wrote that there is no more appropriate day than Pentecost for a congregation to begin a new life together. Jon Delano, a layperson from St. Paul’s who is chair of District III and a member of the Standing Committee, said a few words as well that might best be characterized as a welcome and a pep talk. The rest of the service proceeded uneventfully, and worshipers greeted the preacher, partook of the refreshments, conversed, and, eventually, said their goodbyes. It was, I think, a good beginning for a St. David’s returned to its former status in the Episcopal Diocese of Pittsburgh. Lou will preach next week. I hope that no one will be disappointed that he doesn’t play guitar. 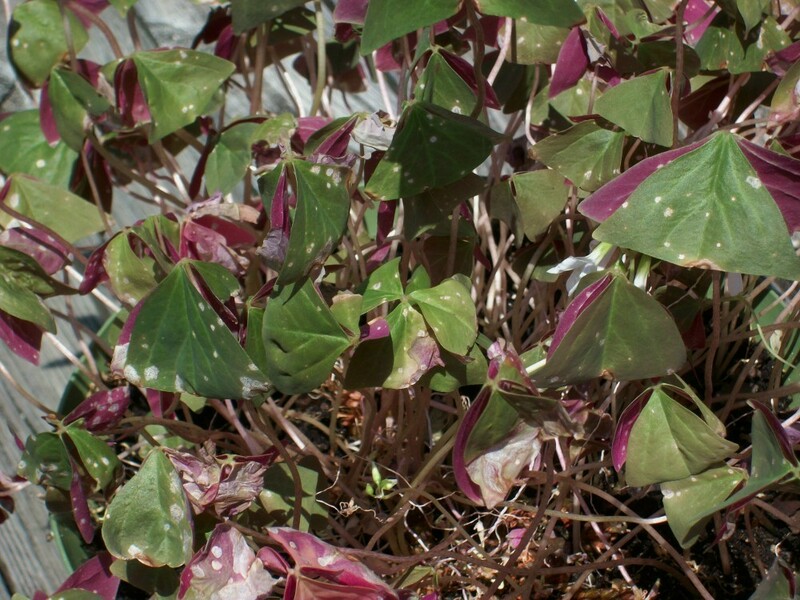 My Oxalis—see picture below—seems to be sick. In many ways, the plant seems fine, but the leaflets have developed white spots. Can anyone suggest what the problem might be and what I should do about it? An interesting thought occurred to me yesterday. What sparked the idea was the news story that Pakistani doctor Shakeel Afrid had been convicted of treason for his assistance to the CIA in finding Osama bin Laden and sentenced to 33 years in prison. This was just the latest indication that Pakistan, ostensibly an ally, is substantially hostile to U.S. interests and coöperates with the U.S. only insofar as it is necessary to collect billions of dollars in foreign aid and other compensatory payments. Pakistan–U.S. relations are most problematic with respect to our operations in Pakistan’s Tribal Areas, where, it seems, we operate drones with impunity to kill members of the Taliban. That the Tribal Areas provide safe haven—relatively safe haven, anyway—for the Taliban is one reason the war in Afghanistan has dragged on so long. My thought may be half-baked, as I haven’t considered all possible implications, particularly, but not limited to, the fact that Pakistan is a nation possessing nuclear weapons. Anyway, here is my idea: Why not just declare war on Pakistan and fight a real war in the Tribal Areas? The Rev. Canon Dr. Harold T. Lewis has announced that he will be retiring from his current position as rector of Pittsburgh’s Calvary Church. He plans to devote his time to writing. Lewis is the author of several books and numerous hymns. He will perhaps remain best known in Pittsburgh for the lawsuit he initiated against then bishop Robert Duncan and other diocesan leaders in 2003. The litigation resulted in the parties signing a stipulation two years later. 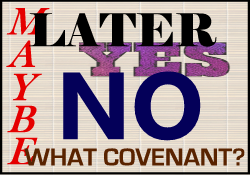 That agreement was responsible for the court’s awarding diocesan property to the Episcopal Diocese of Pittsburgh after Duncan supporters voted to leave The Episcopal Church in 2008. I noted on March 26, 2012, that the parish property of St. David’s, in Peters Township, is to be returned to the Episcopal Diocese of Pittsburgh later this month by the congregation—part of the Anglican Diocese of Pittsburgh—currently occupying the building. There has been much speculation as to the future of the property, on which there is a substantial mortgage. As it happens, not everyone will be leaving Peters Township to begin worshiping in an unused Roman Catholic church in Canonsburg on May 27. Some people will be staying behind to become the congregation of a restored St. David’s Episcopal Church. Initially, the congregation is expected to number somewhere in the 30s, but it is likely that former parishioners who have stayed away from St. David’s during its “Anglican” period will return. Others may be drawn to a more mainstream Episcopal church from the residential neighborhoods surrounding the East McMurray Road property. St. David’s, for the time being at least, will not have its own priest. Instead, two priests from my own parish, St. Paul’s, Mt. Lebanon, will conduct services at St. David’s. Rector Lou Hays and associate rector Kris McInnes (who grew up at St. David’s) will alternate performing duties at the nearby church. This is made practical by the addition of Michelle Boomgaard to the St. Paul’s staff as associate rector. The recently ordained Boomgaard has been serving as an assistant at Church of the Redeemer, in Squirrel Hill. A grant from the diocese is allowing St. Paul’s to replace Mabel Fanguy, a part-time priest who left St. Paul’s recently, with the full-time Boomgaard. Episcopal services return to St. David’s on Pentecost, May 27. Update, 5/15/2012: A letter to “My sisters and brothers in Christ” from Harold Lewis arrived in the mail this morning announcing the upcoming retirement of Calvary’s rector after sixteen years. According to the letter, Lewis’s resignation takes effect February 28, 2013, but his last Sunday will be November 25, 2012. He and his wife Claudette plan to remain in Pittsburgh after his retirement. Every now and then, my inner Ogden Nash comes to the fore and I begin thinking of poems lacking, well, gravity. Having written no poetry since Labor Day—I think that effort was pretty good, however—perhaps offering a few silly poems is better than letting yet another month pass without writing any poems at all. So, here are three poems offered just for fun, rather than for inspiring sober reflection. To your printer’s being out of ink? Were keen on turning lead to gold. Did not convince them not to try. You may have noticed that two atomic elements feature prominently in these poems. I was so pleased with my poem “Mercury” that I’ve long thought of writing a series of poems about each of the atomic elements. It’s easy to understand why no one has done this before, however. Rhyming words like “molybdenum” and “praseodymium” would have taxed even the talents of the real Ogden Nash. Anyway, thoughts of the Periodic Table were, in part, responsible for two of the three efforts.